Humans have been using and growing Aloe Vera for thousands of years. It is one of the most widely known plants because it is used both as a decoration and for medicinal purposes. Aloe Vera is native to the tropical region of North Africa. But you can grow Aloe Vera in your home too! With just a little care, you can have a healthy and gorgeous looking plant. 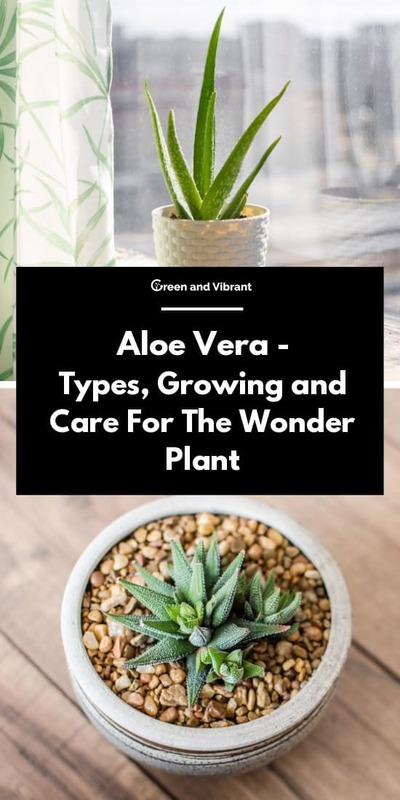 Follow this in-depth guide, and you will be set to properly grow and care for your Aloe Vera plant. Short-stemmed, Aloe Vera is a kind of succulent. They grow and form a rosette. It is sometimes called the "Wonder Plant" because Aloe Vera has many therapeutic properties. Extract of Aloe Vera is used in many skin and beauty products. The gel of Aloe Vera is used for relieving sunburn and it even helps to heal a wound quickly. You will be glad to know that you can use your own potted Aloe Vera for sunburn and beauty care. Name Aloe Vera, also known as "Wonder Plant"
Most of the Aloe species are popular houseplants because they need very little care to grow. There are over 400 types of Aloe plant. Here are some of the most popular. Aloe petricola or also Stone Aloe has vibrant red, orange, and yellow flowers. This is very unique, which makes it easy to identify. It will be a great addition to any type of garden. 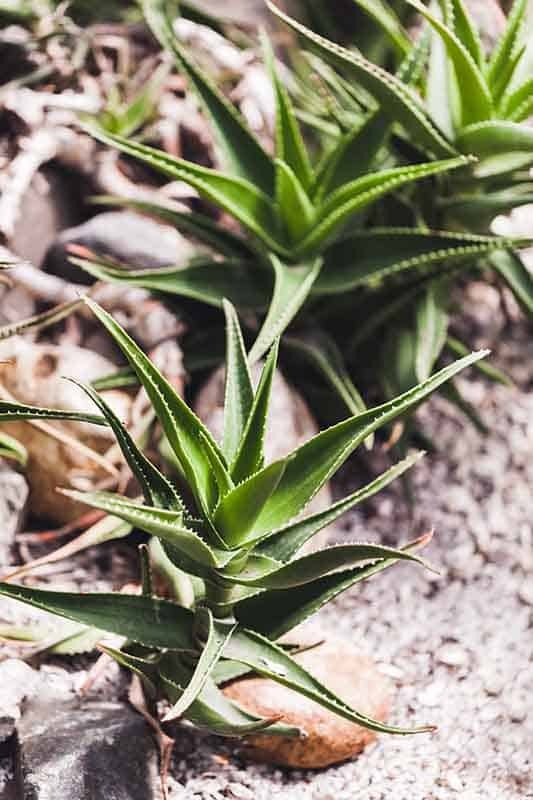 Stone Aloe also improves air quality and is often used to help heal minor burns and wounds. Aloe ciliaris got its common name, Climbing Aloe, for its ability to climb to grow long up to 5 m (if supported correctly). It has large orange and red flowers, so it’s also easy to differentiate. Climbing Aloe attracts sunbirds and bees, which is great for enhancing the environment around the plant. Climbing Aloes bloom all year round, and if supported, it’s a good choice for a houseplant. Commonly known as Cape Aloe, Bitter Aloe, Tap Aloe or Red Aloe, this species is very popular because of its bitterness. 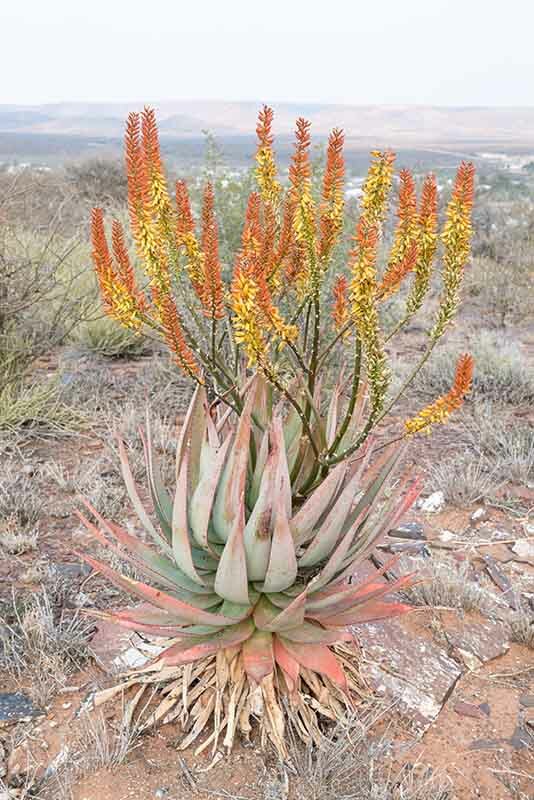 Bitter aloes are useful for skin care and medicine. It grows red flowers that grow 1-4 feet above the leaves. Many well-known cosmetics use this particular aloe because it nourishes skin naturally. Because of this Aloe's pink tint or margin on blue-green leaves, Aloe striata is called Coral Aloe. Though sometimes it is mistaken with another Aloe plant (Aloe stiatula), it's very different. Coral Aloes are very strong. They can survive in very dry and hot environments. It is a beautiful succulent, and it great for healthier air. Aloe aristata is commonly known as Lace Aloe and Guinea Fowl Aloe. It's a stemless succulent and has unique white speckles. It has deep green leaves and grows red-orange flowers. Its large flowers, which can be up to 20 inches, attracts a variety of birds, insects, and bees. It's helpful to other plants around it. Its therapeutic roots are widely used in making healing medicines. 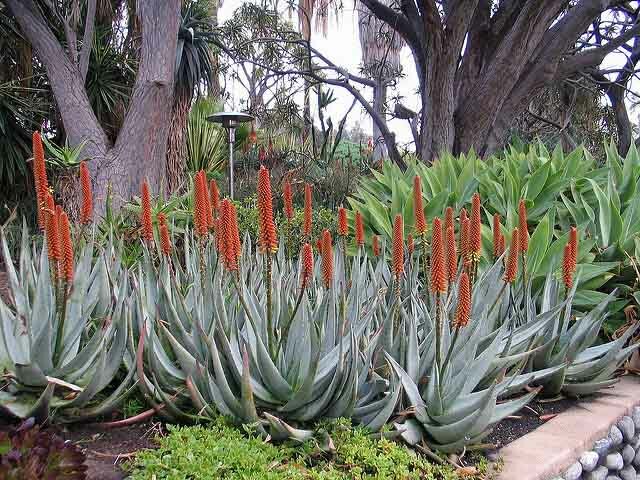 Candelabra Aloe can grow up to 10 feet tall, like a small tree. With multi-headed sprawling succulent that grow bigger than most others of its kind, it resembles a candelabra. It produces vibrant red-orange flowers and the flowers rise high above the leaves for a unique appearance. Studies have proven that Candelabra has elements that can fight harmful organisms. Aloe humilis has long and triangular leaves with white speckles, which grow and take the form of a rosette. It grows red, orange, and yellow flowers. It is one of the popular choices among gardeners. It looks very good with red and orange blooms. Its gel is an effective medicine for sunburn. Aloe Vera is very popular with the modern gardener because of its medicinal benefits but also because it takes less time to care for it. By following these instructions, you can take care of your Aloe Vera plant without any trouble. Aloe Vera does very well in 55 to 80 degree Fahrenheit temperatures. Not too hot or too cold. Average. In winter, it does well between 20-30 degrees Fahrenheit. It can tolerate dry seasons very well, but Aloe Vera needs full sun to flower. Because it is a succulent, it needs very little water. Do not overwater or underwater it. Most house succulents die because of wrong watering practices. Succulents are equipped to tolerate drought but need a small amount of water to grow and flower. When watering Aloe Vera, check the soil by putting a finger 2 inches into the soil. If it feels dry, water it. If not, do not water. Water when the soil is completely dry. During winter, it requires a very little amount of water, so come back every 3 weeks to check the soil at that time. Aloe Vera can adapt to low light, but to grow and to flower, it needs full sun. 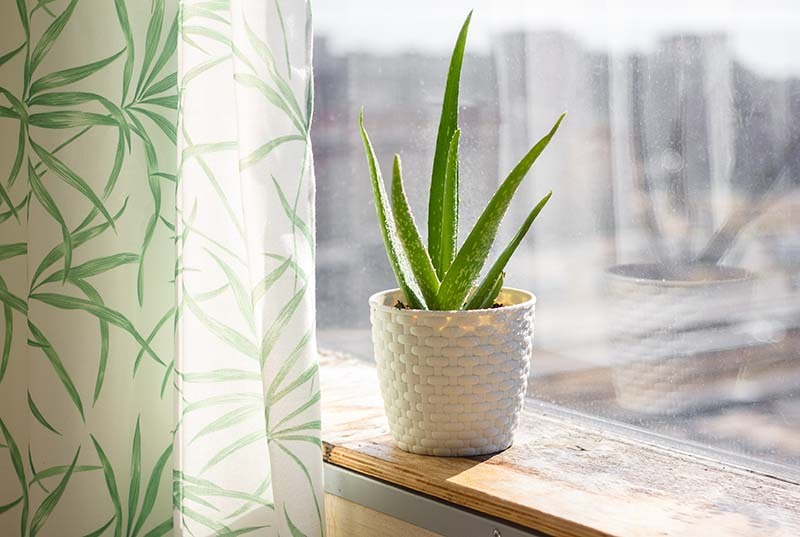 Place your Aloe Vera near a window where you have bright light all day long. Bright and indirect light is good for Aloe Vera. You can comfortably grow and nurture your Aloe Vera in an indoor environment. Aloe plants originate from desert like places. So, naturally, they are adaptive to drought. They can survive in dry and poor soil. It can grow in different soil types. But as it is a succulent, rich and well-draining soil is best for it. We suggest building a mound before planting an Aloe. Mixing organic compost with the soil will help the Aloe grow fast and produce bright flowers. You can give your Aloe plant an extra boost by fertilizing it. Aloe Vera does not generally need fertilizer to survive, but if you want to take good care of your plant and want to see bright flowers blooming, you should fertilize it once a year. Do not fertilize with standard fertilizer though; go for water-based and phosphorus-heavy fertilizer. Before fertilizing your Aloe Vera, make sure you give it plenty of water and then drain it properly. Watering will protect the roots. Do not fertilize the leaves, flowers or the stem, only the soil. Aloe Vera needs very little humidity as it is drought resistant. It can be grown indoors and outdoors. Unlike other succulents, propagation of Aloe Vera is difficult. The usual method of using leaf cuttings do not always work when it comes to propagating Aloe Vera. The chances of a leaf of an Aloe forming roots and growing into a healthy plant is very low. The best way to propagate Aloe Vera is through offshoots. 1. Aloe offshoots or pups are basically baby plants that are attached to the main plant. Wait until the baby plant is big enough to cut it off from the mother plant. The size that is required to remove it differs. Generally, the offset needs to be of one-fifth the size of the main or parent plant. Look for leaves that have several sets of true leaves. 2. Once you find the right offshoot, remove dirt from the base of the pup. 3. Now, determine where you will make the cut. Cut the leaf at the base by using a sharp, clean knife. The removed leaf should have a complete root system attached to it. 4. Sharp and clean tools are very important because Aloe Vera has the risk of getting contaminated by pests or disease. 5. Now, leave the offshoots somewhere warm for a few days to a couple of weeks. Wait for a film to form over the cut. This film will protect the leaf from getting infected when you plant it in the soil. 6. Find a good pot with a drainage hole at the bottom. 7. Make your potting mixture with well-draining soil. Fill the bottom of the pot with gravel or bark to help the pot drain excess water. 8. Now, when the film has formed over the cut, place the leaf cut-side down into the soil. Stick about one-third of the leaf in the soil. You can dip the cut-side into root hormones before planting if you want. 9. Now, place the pot with the offshoot someplace sunny, and water it. For the first 4 weeks, you have to keep the soil moist. Once the leaf starts growing, follow the usual practice of watering it only when the soil is dry. You will notice it start to shrink or die, but don’t worry; they do that when developing roots. If everything goes well, you will see new leaves in 4-5 weeks. Repotting always has the risk of damaging the plant. But you can do it. 1. To unpot the plant, first, loosen the soil around the plant either by squeezing the sides of a flexible pot or shaking the pot and using your hands. 2. Tip the pot and wiggle the plant out. 3. After removing the plant from the pot, examine the roots and shoots. Dark, brown oozy roots are not good. That means the roots are rotting away. Also, look for offshoots you can cut off. Cutting offshoots will help your Aloe thrive beautifully. 4. Follow the instructions from propagating to slice the pup or offshoots. Be sure to keep them in a dry place, Aloe is slightly toxic to animals, so make sure no animals come in contact with it. 5. Prepare your pot with new soil that will drain well. Put gravel at the bottoms of the pot so that the pot can quickly drain the excess water. 6. Place the plant into the soil and loosely fill in the gaps with more soil. Most Aloe plants have tendril-like leaves that are fleshy and contain a gel-like substance. People prune other succulent to keep the plants shapely and beautiful. But for Aloe Vera, people prune it to harvest the gel in the leaves. Follow these steps for pruning. 1. You need a sharp and clean pair of pruning sheers or a knife. One good tip is to wipe the cutting tools with rubbing alcohol so that the leaves of the Aloe Vera do not get infected. 2. Look for leaves that are brownish or that have brown tips. Trim them off. Sometimes, you have to cut out a whole leaf. These parts turn brown when they are dying. By removing them, you will help the plant to stay healthy. Do not worry about the open cuts of the plant. They will heal in their own time. 3. Cut out a section of a leaf to harvest its gel. Cut out larger sections if you need to. But remember not to prune more than one-third of the Aloe Vera plant at a time. 4. Besides harvesting, cut out offshoots to propagate them. Taking care of an Aloe Vera plant is not difficult, but there are some problems you might face in caring for your Aloe plant. Aloe Vera plant is not growing. If you notice a difference in your plant, here are some issues to look out for. 1. You are not watering correctly. A mature Aloe Vera needs water, but not that much. Overwatering can kill it as easily as underwatering. 2. Check if the pot is draining the extra water. If the pot holds water in it, too much water or damp soil will rot the roots. 3. Your soil in the pot could be too alkaline. This can prevent your plant from growing. You can solve this problem by adding sulfur. 4. It might need better sunlight. Aloe Vera does not do well in direct sunlight, so place your plant in a place where you can get indirect light all day long. 5. The roots might be bound by the pot. It could be possible your plant is not growing because the pot is too small. Try re-potting it. Like other succulents, Aloe Vera is susceptible to overwatering. You have to be careful with watering your Aloe Vera. Only water it when the soil is dry. Do not keep the water in the catch tray or saucer. it is same as over watering the plant. Water your plant and then let it drain completely. Aphids: they feed on the leaves’ gel and prevent Aloe Vera from growing. To solve this, use pyrethrin-based insecticide spray. Scale Insects: scale insects can re-produce over and over if not treated carefully. This causes small, yellow and brown bumps on the leaves. Solve the problem with rubbing alcohol. Fungus Gnats: these are often a sign of overwatering. They do not hurt the plant. To solve this problem, keep the surface of the soil clean and adjust your watering routine. Mealy Bugs: like scale insects, use rubbing alcohol to get rid of mealy bugs. Though Aloe Vera is safe to use with no side effects oral ingestion of Aloe Vera is not safe. It can cause diarrhea and decrease the absorption of medicine. Aloe Vera is also not safe for pets or animals. It’s best to keep the pets away from the plant. Here are some of the most common questions people have when growing Aloe Vera. 1. How much water (in liters) does an Aloe Vera plant need? Aloe Vera is a succulent and it is drought tolerant. Aloe Vera does not need much water. What they cannot tolerate are frost and too much water. It will kill them. There is not an accurate measurement of how much water you should use. What you can do is check whether the soil is wet or dry. It's the only and best way to know when to water. Water until the soil looks wet. Drain it of excess water both from the pot and the saucer at the bottom. 2. How long can you preserve Aloe Vera gel without a refrigerator? The best way to store the gel is by refrigerating, but if you want, you can store extracted get in an airtight container for up to 7 days. The benefits of the gel will decrease after that. 3. I planted my aloe in my garden. I found some bugs in the soil this morning. What can I do? Aloe Vera is vulnerable to pests and diseases outside, and your plant's tips could be drying up because of a new environment. You can prune them if they turn brownish color. One way to keep the insects away is by sprinkling eggshell crumbles around the base of the Aloe plant. Aloe Vera makes a great addition to any house or public area. Not only can you use for decoration, but it is one of the most recognized medical plants, and it improves air quality around it. So, why not have one in your home? It's not difficult to care for, and you can grow more from one.